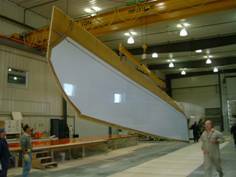 Resin infusion became standard for Kelsall Catamarans five years ago, as the perfect partner to the mould table. Applying resin by hand is never a pleasant occupation, especially into difficult to reach areas. Kelsall clients tell us how satisfying they find resin infusion. Particularly those who have done it the hard way before. One project in China saw the women excelling at setting out and applying resin infusion techniques. The standard materials and equipment applies to the typical one-off project. Large or commercial projects for longer term will depend on size and other circumstances. Resin infusion is a simple process - air is sucked from the bag creating voids around the glass fibers and in the resin flow media. Resin is then allowed to flow into the spaces between fibers etc, replacing the vacuum. A high vacuum is applied to the bag before the taps are opened to allow the resin to flow. 2-3 hours are enough for the larger panels. The set up needed on the table is also simple. However, there are many different ways of achieving good results. We pass on our knowledge gained over many projects to builders with RI Guidelines with designs. There are also many others using RI and many suppliers. Usually we find that no two RI shops are run the same way. Hence, not all shops will have the same equipment or materials. We recommend that you start with a test panel before starting main laminating, and to recognise a quality laminate.